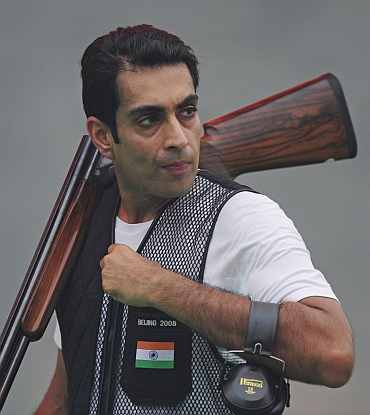 Led by Olympic champion Abhinav Bindra and Commonwealth Games hero Gagan Narang, Indian shooters would look to carry forward their stupendous CWG form into the Asian Games as the competition begin in Guangzhou on Saturday. Indian shooters had set the shooting range set on fire at CWG by wining 14 golds but the road would not be that smooth here as the field comprises some really tough customers. 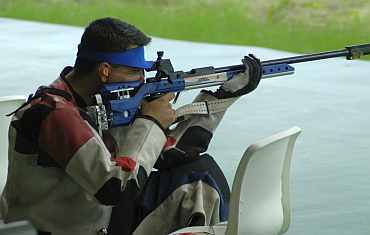 But shooters are expected to win the first medals for the country in the Games, the biggest multi-discipline sporting event after Olympics. Bindra will come face to face with Zhu Quinan, the man he beat to win Olympic gold in 10m air-rifle gold two years ago in Beijing while Narang would also be a contender in the same field. 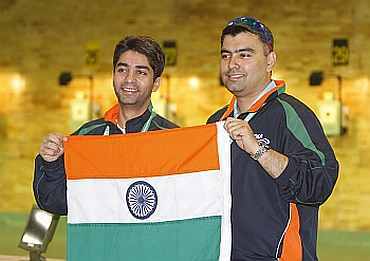 Bindra and 2004 Athens Olympics champion Quinan, who beat the Indian in last month's CWG for the 10m air rifle gold, are expected to provide the early fireworks on the first day of shooting at the Aoti Shooting range. The Indian duo would aim to stop the home favourite shooters Chinese from lifting the gold in the event for the fifth consecutive time but the challenge would be quite stiff. Also in the fray is China's Cao Yifei, the 2010 Sydney World Cup winner, to make the contest a potentially hot one. The 27-year-old Narang, who stole the thunder from Bindra at the CWG with a four-gold haul, is going into the contest on a high while Bindra has gone off the boil a bit after becoming India's first Olympic individual champion two years ago. Narang is also in the running to pick up medals in the team competition in the 10m air rifle that will be held concurrently, with Bindra and Sanjeev Rajput being the other team members. Narang would be eager to attain the gold in these Games after picking up three bronze medals in rifle competitions in Doha, Qatar four years ago. He had finished fifth in the air rifle event then but his recent run puts him as among the title-favourites. The Hybderabad-based Narang has the chance to become the most successful shooting medallist in these Games, having entered the 50m rifle prone and 3-position events too. But he knows the stiff task ahead of him with Chinese marksmen looking as a major threat. Bindra, too, would be eager to display his wares after missing the last Games in West Asia due to a back injury. A total of 25 men and 15 women shooters have been named in the Jumbo Indian contingent for the Games, with the hope that they would provide a big boost to the country's medal hopes. Among the other major Indian medal hopes in shooting are Asia's current number one in men's trap event Manavjit Sandhu, world number three Ronjan Sodhi in men's double trap and women's world 50m rifle prone champion Tejeswini Sawant. Sandhu collected a silver in 2006 and is aiming for the gold and his main threat is expected to come from Li Yajun who is eager to make up for China's medal drought in the trap event in Doha. Sodhi, who won the silver in CWG after clinching the gold in the 2010 ISSF World Cup final, would be challenged strongly by the Chinese double trap duo Pan Qiang and Mo Junjie who are ranked just behind him at number four and five. Tejaswini's profile has improved drastically since the 30-year-old markswoman bagged two bronze medals in Doha in 50m Rifle 3-position and prone. 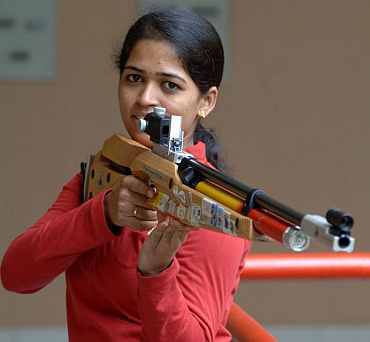 But she would have to contend with joint Chinese world record holder Lu Liuxi in the 10m air rifle competition and she would have joint world record holder Suma Shirur (400) and Kavita Yadav helping her in the team championship as well as contesting for individual honours. Jalandhar college student Amanpreet Singh and CWG gold medallist Omkar Singh from the Navy will be seen in action on the opening day in the men's 50m pistol. Omkar's chances are better in the 10metre Air Pistol scheduled on Sunday. He finished second in the World Cup in Sydney earlier this year and was fourth last year in the Asian Championship in Doha. He is also entered for Mondays 25m Centre Fire Pistol. Omkar's other team-mate in the pistol event is Vijay Kumar who has also been entered in all three events. Samaresh Jung, the five-gold hero of the Melbourne CWG four years ago, is to take part in the 25m Standard Pistol on November 17. Indian shooters picked up a whopping 14 gold, out of the 38 won by the country in the Delhi CWG, 11 out of 27 silver medals and 5 out of 36 bronze medals.